Spring is a season of wet weather and new growth. Plants emerge from the ground, animals begin to migrate and humans prepare their homes and gardens for the summer months ahead. But as seasonal droughts and energy consumption become increasing concerns, many homeowners have turned to rain barrels to meet their lawn’s demand for water. A rain barrel is a system that collects and stores a portion of the rainwater that runs out of a downspout or off of a roof, keeping this runoff out of our rivers and streams. While this water is unsafe for drinking, it can be used for non-potable purposes like watering plants or washing cars. 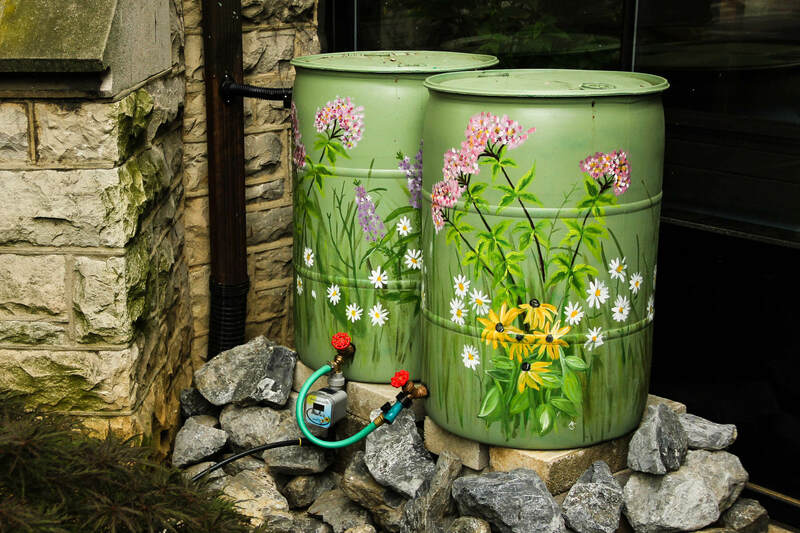 A standard rain barrel holds between 55 and 90 gallons of water, and can come in a variety of shapes, colors and designs. On average, rain barrel owners can save about 1,300 gallons of water each summer, reducing water use charges on their utility bills. But before you begin construction, keep in mind that a number of hardware stores, garden centers and local governments offer ready-made rain barrels to customers who would prefer to purchase a barrel instead of building their own. Before you pick up any building materials or tools, determine where you would like your rain barrel to go. Typically, rain barrels are attached to a downspout on the side of a house or building, but can be placed wherever rainwater runs off of a roof. Make sure the location you have chosen for your rain barrel has a flat surface and is in an area where the barrel can be secured. A full 55-gallon barrel can weigh up to 400 pounds when full, and is a dangerous tipping hazard if not secured properly. Use the heavy duty scissors and window screen mesh to create a screened opening through which the rain barrel will collect water from the downspout. It is important that this opening is screened to keep debris out of the barrel and prevent mosquitoes from laying eggs in the barrel. Use the hole saw to drill a hole that is at least 2 inches in diameter near the top of the barrel; this is where the overflow pipe will go. If the overflow pipe elbow fits securely, no further action is necessary. If it doesn’t, secure it with washers on both sides of the barrel and a nut on the inside of the barrel. Use Teflon tape and/or silicon caulking around the opening to ensure a tight seal. Use concrete or wooden blocks to create a raised, stable and level base for the barrel to rest on. Note: It is a good idea to test the stability of this base by filling your rain barrel with water before attaching it to the house or building. Use the hacksaw to cut the home or building’s existing downspout so that the downspout elbow can be attached. Once the downspout elbow is attached, it should sit just above the top of the barrel. Attach the elbow to the downspout with a screw. Place the barrel beneath the downspout, making sure to align the opening of the downspout elbow with that of the barrel. Attach the barrel to the house or building using a clincher strap. Cut and attach the overflow pipe to the overflow elbow (installed in step two) and direct the pipe to an appropriate overflow discharge location, such as a lawn or garden bed. Create an outlet for the collected water by drilling a hole near the bottom of the barrel and attaching the hose spigot. Secure the spigot with two washers on both sides of the barrel and a nut on the inside. Use Teflon tape and/or silicon caulking to ensure a tight seal. Use it! After it rains, fill watering cans or attach a garden hose to the barrel’s bottom spigot. Follow Stephen Barry from Arlington Echo as he shows us how to easily and properly install a Rain Barrel next to your home. Installing rain barrels is a very effective method of helping to reduce urban/suburban stormwater runoff pollution in the Chesapeake Bay. Once you have installed your rain barrel, its maintenance is simple. Check it periodically for leaks, cracks, clogging and rips in the screen. In the winter, drain the water out of your rain barrel and turn it upside down. Use the flexible downspout elbow to redirect your downspout back to its original location until the spring arrives and the threat of freezing is gone.